Customize these breakfast crepes with any fruit you want. Combine first 5 ingredients in blender for 30 seconds. Meanwhile heat a nonstick pan over medium heat. Spray pan with cooking spray if desired. Pour batter to 5" diameter and cook crepe on one side. Flip when lightly browned and repeat cooking on second side. Continue until batter is gone making approximately 6 or 7 crepes. In same pan, warm fruit with a bit of Stevia powder if desired. 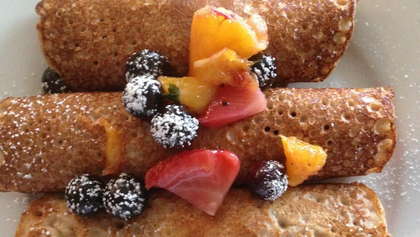 Place by tablespoon into center of each crepe and roll into a log saving some fruit. Place logs on a plate, top with remaining fruit and sprinkle with powdered sugar.